Concrete cracks are normal occurrence but often misunderstood by homeowners. In fact, cracking is one of the most common causes of complaints in the construction industry. While most concrete cracks are not dangerous and do not pose a serious structural threat, they are, nevertheless, unsightly. In some extreme cracking cases, they negatively affect the durability and serviceability of the structure. Crazing Cracks. These look like shattered glass or spider webs on the surface of the concrete slab. The cause of this type of crack is the rapid evaporation of water from the top of the concrete slab. 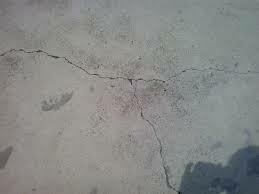 While they may not look good, crazing cracks do not affect the structural integrity of the concrete roof slab. However, since the cracks are very fine, they cannot be repaired. Expansion cracks. Concrete slab, similar to other materials, expands under hot weather. The expanding slab pushes against neighboring materials such as an adjacent slab or wall. If these materials do not give in to the pressure, the slab will crack from force. Overloading Cracks. Putting too much weight on top of a concrete slab roof could cause cracks. While concrete is very strong and durable, it still has limits on the load it can carry. Too much load placed on top of concrete could crush it. While the weight may not be enough to pulverize the concrete, it could cause cracks to appear. The compressive strength of concrete is greater than its flexural strength, hence it bends under the weight. Plastic Shrinkage Cracks. The most common cause of cracks is probably plastic shrinkage, which can occur a few hours after the slab is poured. This crack usually happens during hot weather. Having excess water in the mix with concrete is the cause of this crack. Water occupies space in the slab and forms part of its size. When water evaporates during curing, the slab becomes smaller. The shrinking creates stress on the concrete slab, which ultimately cracks to relieve the tension. Vertical Cracks. These are caused by concrete settling around reinforcing bars. The cracks are caused when the concrete near the top partially sets while the rest of the concrete are still settling. Applying vibration to the concrete can prevent this crack from forming.